In a date and a name the individual numbers, 0 to 9, provide information about the character traits that are held within that date and name. 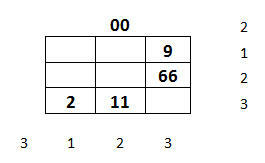 The numbers in a date and a name are analysed using a 3 x 3 grid. 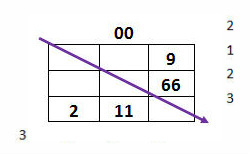 Each of the digits, 0 to 9, is assigned a place on the grid. As you can see in the image above, there are 4 rows or levels to the grid and there are 4 columns to the grid. The 4 rows or levels are referred to as the Planes of Expression and in this model are described as Spiritual, Universal, Social and Individual. These describe the nature of the interpersonal relationships in which you may be involved. The distribution of your numbers will indicate where you are most or least comfortable in your levels of interpersonal communication and interpretation. The 4 columns are referred to as the Modes of Behaviour and they may be described using various corresponding terms. For now we will refer to them as Intuition/Passion, Emotion/Feeling, Physical/Sensing and Reason/Thinking. There are significant number structures used in Numerology, Tarot and Kabbalah - essentially 22, 10 and 4. In any set that is a structure of 4, the table of correspondences may be applied to give meaning to that group. On the grid the numbers 1 to 9 are directly used for describing the qualities of the world in terms of thinking, feeling and doing. There is a quality that is not so easily measured - the quality of Intuition/passion. This quality comes in from somewhere else and adds an extra dimension - a depth to our being. 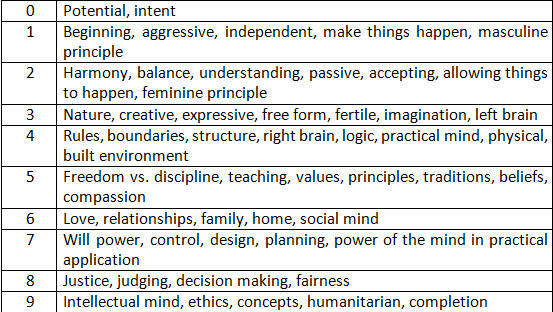 This is why in the grid image above, the quality of intuition/passion sits to the side. It is measured by counting the intensified numbers. Similarly with respect to the Planes of Expression, there is a fourth dimension of Spirituality that is represented by the 0. The 0 sits above the grid and is not counted in with the other numbers. The 0 is an unknown quantity of Nothingness that holds the potential of Everythingness. In the image below you can get an idea of how the qualities of Spirituality and Intuition add depth to the human condition, otherwise we are just a flat, 2 dimensional entity. The central core of our worldly entity is the physical pillar represented by the numbers 1 4 7. On either side of this pillar are the pillars of force and form - severity and mercy - reason and emotion. The emotional numbers are 2 5 and 8. The thinking numbers are 3 6 and 9. 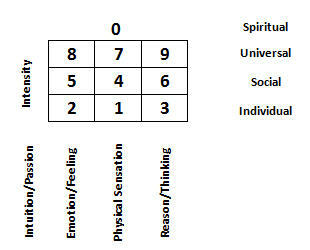 The numbers 1 2 and 3 represent the 3 human qualities on the Individual level. The numbers 4 5 and 6 represent the 3 human qualities on the Social level. 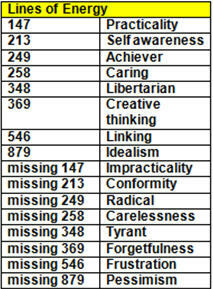 The numbers 7 8 and 9 represent the 3 human qualities on the Intellectual, Ethical or Universal level. A blank grid represents the average person with no adornments or added features. We all come into this world with the average set up. When we are born, an empty grid is populated, with the numbers from our birth date or the values of the letters of our birth name. These are our extra qualities that we bring with us - our Gifts & Talents that make us different to others. The example below shows Marilyn Monroe's birth date (01/06/1926) numbers on the grid. Each number in the birth date goes into the cell for that number. The 0's go above the grid. Notice that I have included the leading 0's from the day and month of Marilyn's birth date. The numbers to the right and below the grid show the count of the numbers for each row and column. 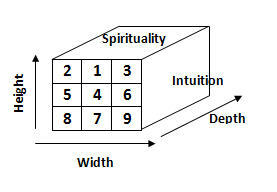 Notice that the quality of Intuition has a count of 3. This is calculated by adding together the number of intensified numbers. In this example the 0, 6 and 1 are intensified. Don't count all of the numbers, only the extra numbers more than one. Missing numbers are just as important as the others. Where we are missing a number (a blank cell) then it shows an area where we may struggle in life. We don't have any special talent in this regard. The other side of it is that we may not get too involved in this area and so we keep it simple. Everything is made up of more than one aspect - there is a positive and a negative for everything. The intensity on the 1 critically enhances the qualities of individual identity and independence. Subsequently the central physical pillar is also highly dominant among the four human functions. This intensity brings with it both good and bad. It can make us what we are and we can achieve great things but if we don't learn to manage and temper these qualities they can also be the source of our grief. Examine each of the numbers that populate your grid and consider the missing numbers. Consider your strengths and weaknesses. The numbers of the birth date are much stronger and influential than the numbers of the name. Your name brings qualities to the table and can fill some blanks. It can also over-intensify some cells. For me the birth date grid is the dominant grid. I look at the birth date first and then consider the birth name and then other names to see how they add to the mix. The birth date and the birth name are the most important because they do not change. The usage of names varies and this can weaken the influence but it is important to consider the variations in names and their impact. In Marilyn's birth date grid there is a single Line of Energy. The numbers 3 4 and 8 are missing creating an energy flow that I have labelled as the "Tyrant". The lack of numbers for individual thought, practicality & structure, and care for others at a higher level creates a dangerous quality that may be displayed through an overbearing, dominant attitude. The Line of Energy means that there is a likelihood of this behaviour. It may not always prevail but it has the potential. In Marilyn's birth name, Norma Jeane Mortenson, there are two Lines of Energy - 147 and 546. The 0 does not form part of the central column of numbers. It sits above the entire grid. The Line of Energy 147 has the keyword meaning “Practicality”. The Line of Energy for 546 has the keyword meaning “Linking”. Young Norma Jeane Mortenson would have stood out as being very practical and extremely good at bringing people together. As discussed above in considering the Gifts & Talents, the full Line of Energy on the 546 Social Plane with a count of four digits, is slightly more significant than the four 1's in the single cell on the Individual Plane. Don't get me wrong, the 1's are powerful but the significance of the full line is dominant. This is because both Planes have the same count of digits and are competing for dominance in the behaviour modes. If the Planes did not have the same count of digits, then the Plane with the higher count would be more dominant, but the Line of Energy would still exert influence.